Radiographs are performed daily, using the latest in digital equipment to provide instant images. Providing less radiation exposure to your pet. 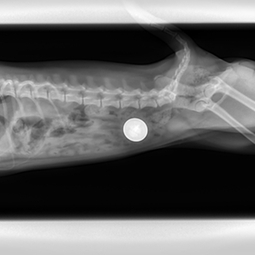 Radiographic images can aide in the diagnosis and treatment of your pet's condition. These radiographic images can be sent to specialists for futher diagnostic evaluations. Both regular and contrast radiographic studies are performed and evaluated by our doctors. These images can easily be emailed or transferred to a compact disc.